, an Italian cardinal and antiquary, the descendant of a noble family of Bergamo, was born there in 1685, He studied at Milan and Pavja, and made considerable progress in the knowledge of the civil and canon law. He went afterwards to Rome, where he held several ecclesiastical preferments, and in each was admired as much for his integrity as knowledge. Benedict XIV. who well knew his merit, was yet averse to raising him to the purple, on account of some disputes between them which took place in 1750. 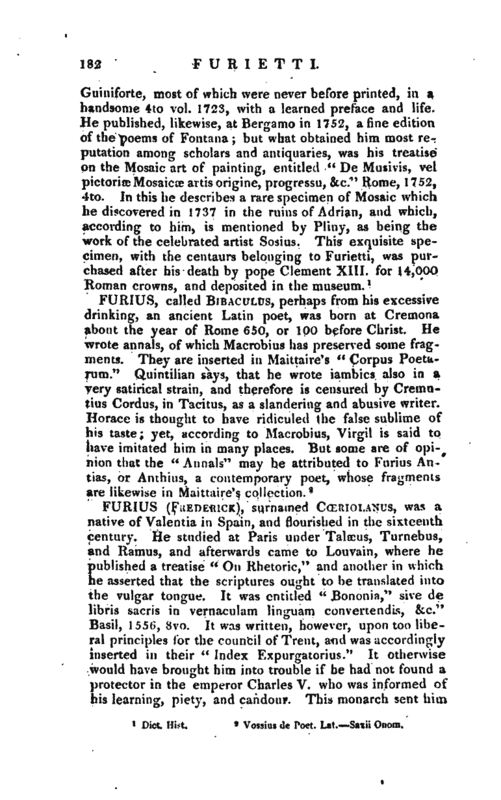 Yet it is said that Furietti might have received this high honour at that time, if he would have parted with his two superb centaurs, of Egyptian marble, which he found in 1736 among the ruins of the ancient town of Adrian in Tivoli, and which the pope very much wanted to place in the museum Capitolinum. 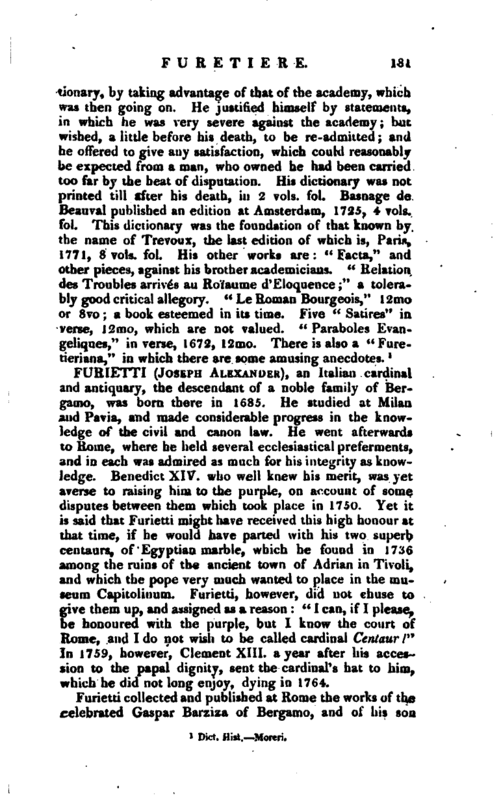 Furietti, however, did not ehuse to give them up, and assigned as a reason: “I can, if I please, be honoured with the purple, but I know the court of Rome, and I do not wish to be called cardinal Centaur /” In 1759, however, Clement XIII. a year after his accession to the papal dignity, sent the cardinal’s hat to him, which he did not long enjoy, dying in 1764.